The journey east was monotonous but fast flowing; the sky looked busy with stroppy grey clouds jostling each other and being buffeted along by the gusts of wind. By the time I docked my car in one of the Southampton multi storeycar parks, there was the promise of a clear sky with a reasonable breeze blowing so the going was good and the forecast fair. 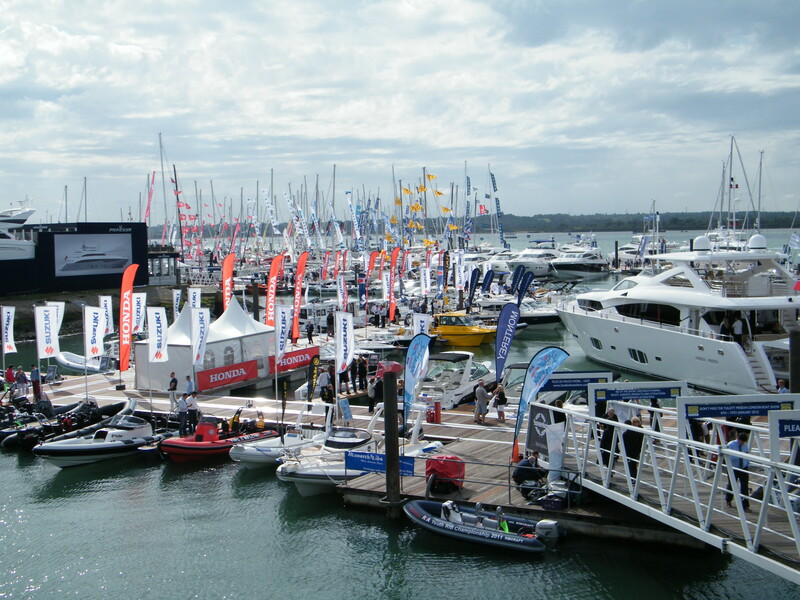 Okay, enough of the nautical narrative; seafarer I am not, but the Southampton Boat Show that opened on Friday 16 September couldn’t have asked for better weather and I would be surprised if sales didn’t exceed expectations that day. 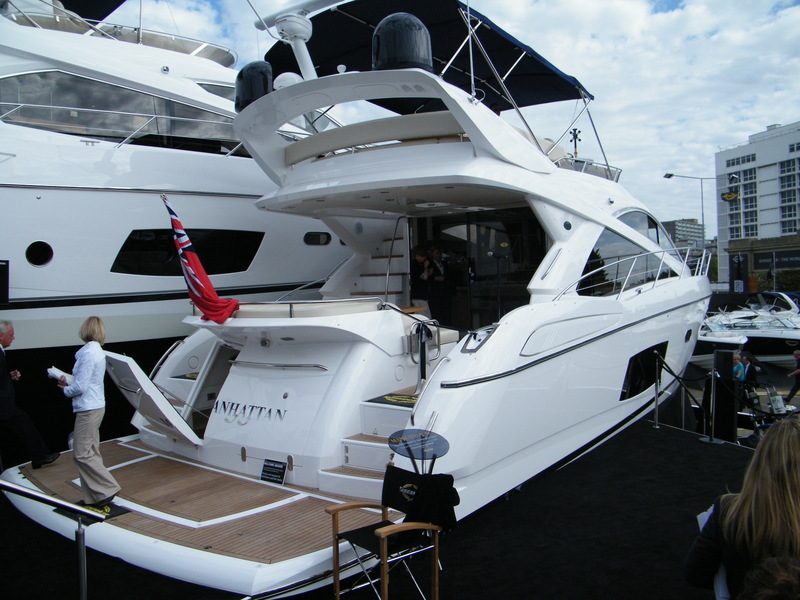 I had been invited along by the splendid Sunseeker Boat Company to witness the launch of their latest bateau, the Manhattan 53. Not wishing to miss such an opportunity, I managed to negotiate entry past the don’t mess with me security guards, and made my way across the show ground towards the Sunseeker launch pad, making a mental note of the stands I wanted to visit on my way back. To say their ‘stand’ is a company declaration of their enormous success would be an understatement with its Hollywood size archway framing the multitudinous display of multi million pound yachts. It never fails to impress me. I was flattered to be welcomed with a smile and ‘how nice to see you again’ handshake from their PR person, but then noticed how many other reporters, photographers, et al also received the same greeting. Oh well. Anyway, standing alongside the others, most of whom had sophisticated and technically ripe pieces of photographic equipment that made my Fuji Finepix look like a pocket Brownie; I was not (much) deterred. The Ribbon Dance Troupe poised for action, the sign language person stood ready and then Michael Jackson ‘Billie Jean’ followed by ‘Thriller’ boomed across the auditorium. Then as I looked up onto the new Manhattan, I saw a young boy, not much older than my own son, with the look of beguiled innocence that all children that age have when faced with something they enjoy but at the same time, with a feeling of apprehension. 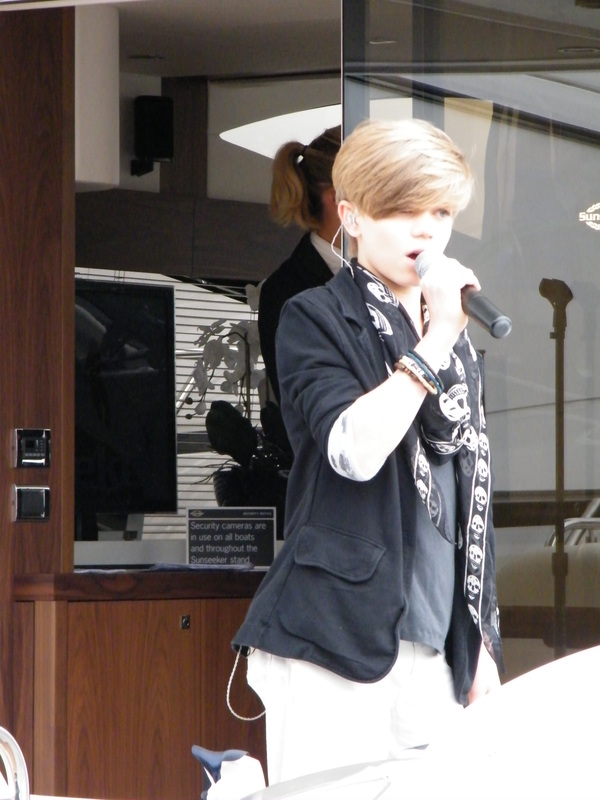 Never having heard of Ronan Parke, I wasn’t sure what to expect but as he took centre stage and started to sing, I suspected I may well hear him again in the future. He belted out the songs with a great deal of energy and whilst I am not entirely convinced he was the best choice of entertainer when it comes to launching a millionaire’s yacht (last year they had Katherine Jenkins), I am sure he will go far, given the appropriate guidance. 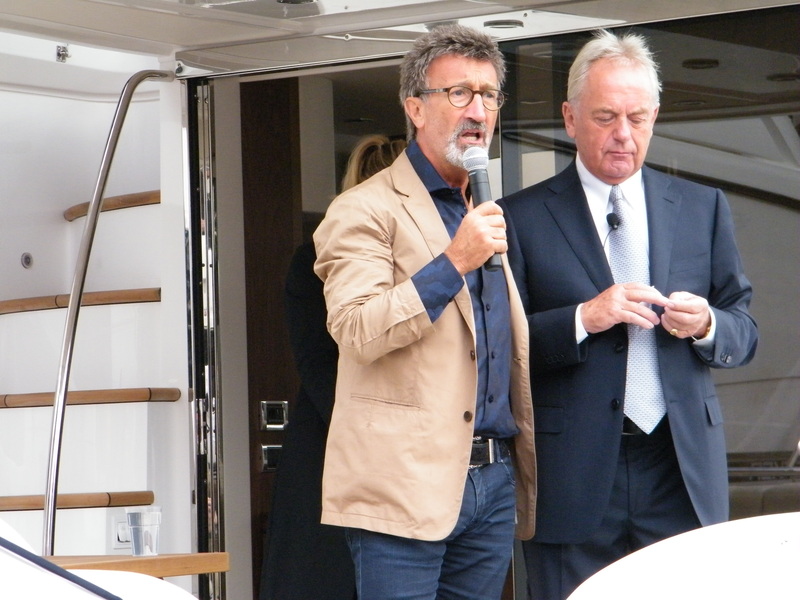 There followed the ribbon cutting ceremony when Formula 1 racing driver Eddie Jordan, a multi Sunseeker owner, did the honours and then came the time to have a look on board. It is a beautiful boat, apparently built for those people who enjoy a bit of crewmanship themselves, although there is a very compact cabin for a crew of one if needs be. The sales people on board were more than happy to elaborate on every aspect to those people who showed more than a passing interest, whilst the open house culture had attracted other audience members who were lacking the several million £ to buy, but who liked to have a peek into what might be if only…….. It was a very pleasant day and there was a definite bon ami amongst the visitors and traders alike. Perhaps it was the warmth of the late summer sunshine or the dream of perhaps one day being able to go along to the show with an open cheque book, but whatever it was, the atmosphere was one of shared conviviality. For my part, it was being remembered by the Sunseeker PR person; little old me; freelance writer, small fry amongst the big fish but with BIG plans for the future and who knows, maybe one day it will be me cutting the ribbon. 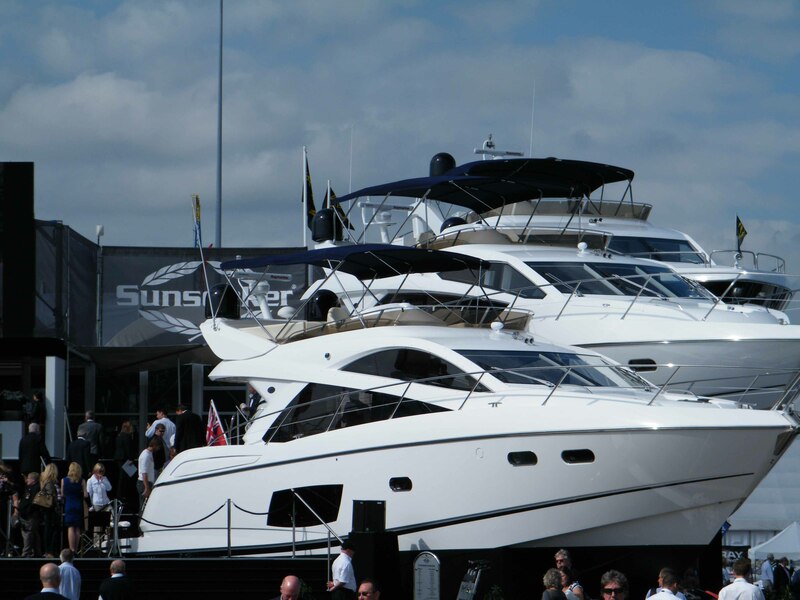 This entry was posted in Special events and tagged boat, Boat Show, launch, Ronan Parke, sailing, Southampton, Sunseeker, yacht. Bookmark the permalink.